Let me begin with my disclaimer. The Legend of Zelda: Shadow's of Evil is now under development by DigiKid_14 AKA Technology Master. All sounds, graphics, and material used in this project is property of their respective owners. Fair-Use Contract. Any redistribution of this game for personal profit can and will be prosecuted. The Legend of Zelda: Shadows of Evil is based in the time after Twilight Princess. A few generations after, in fact. The story of the Game IS AS FOLLOWS. Read only if you want to know everything about the game before its first demo, otherwise it is just a spoiler. Our story begins long ago, long before many think it to be. A great evil fell upon the land of Hyrule, and all who were caught by its temptations fell. This evil grew stronger and stronger, and even more fell its victim. When all hope seemed lost, a young boy was chosen by the goddesses, to cause this evil to fall. The boy worked through dungeons across the land of Hyrule, facing another dimension as he went. Finally, the evil was sealed away with an intricate barrier, and peace was restored to the land. As every other story does, the story soon faded into myth, and has those who believe it, and them who pay no heed. But who helped the boy? None know to this day. Hey now, don't leave yet! I am going to be uploading screenshots (and maybe a demo or two ) for all of you to see to my website soon! Now, my website is not publicly accessible yet, but I will give you a link soon! I welcome all, as long as it is not spam, or saying how much you hate Zelda and wish it would disappear. If you say that, I'll likely delete your post in the thread. Sorry, it was of your own accord! One Screenshot Uploaded! Will be Working on the restyling of the graphics next! 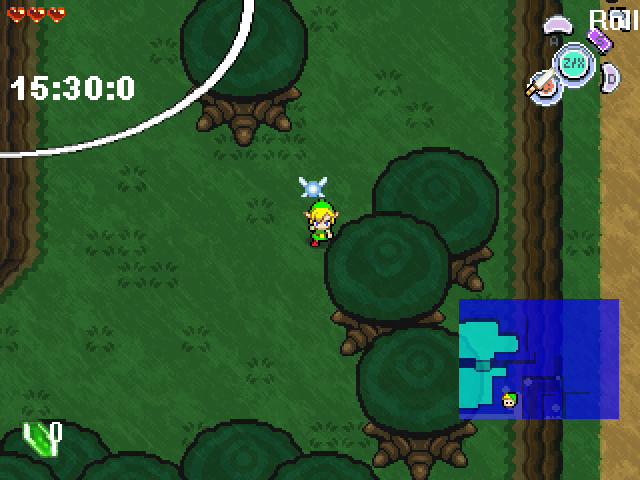 I have officially decided that the game will be done in the Legend of Zelda: Four Swords Style, and I here have a screenshot to show off the HUD and some of the FSA Filtering! Well... I have decided to postpone the project till the summer (When I actually have time, screw life) and that should be my continued development date.